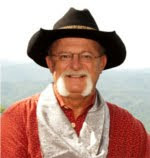 The Veteran returned to his ranch and was collecting strays a few thousand feet high up on a mountain plateau. He could see a hundred miles or more at the valley far below. He watched the sparks disappear above while finishin' up his stew. The breeze was pushin' on his 'stache and was cool upon his face. He said outloud, "Thanks ya, God, for this here station & this majestic place." He continued talkin' to his creator, though not a word was said. It was his way of prayin', I guess, with thoughts there in his head. "Thank, ya, God for givin' us this country, not just here, but all of our land. Like the corn fields there in Iowa & the coast of Maine with its black sand. But I learned 'bout places as a kid back in class, readin' books and such. I sometimes think about those places to visit while ridin' on my pony. Like seeing sawgrass in the Everglades, Minnesota's lakes, and the great redwoods. These thoughts keep me from gettin' lonely." When colorful lights exploded in a town down below and happened to catch his eye. He realized it was city folk celebrating the birth of this here nation. How many of them have seen our land and all of God's creation? Now ain't it funny how some folks will throw a party just once a year to celebrate the past? To take its place to do what was wanted when they wrote that Democratic Rule. And that there paper signed in '76 was nothin' more than a tool. Maybe, if people thought about America more than one day in a year, things could once again be good. People might help each other out, take care of the old, and live true brotherhood. We could throw away them contracts and go back to the shake of a hand. Families might be rock solid rather than blowin' like the sand. And they might be kinder and stop this ridiculous suin'. Greed could be replaced by simply gettin' by. And listenin' to our anthem might put a tear drop in the eye. He noticed a light flickerin' way out in the west. What the heck can that be down there in the dark? I know it's more than a cowpuncher's campfire spark. It seems to be movin', but ever so slow. Whatever it is, it's sure puttin' off a glow." He watched it for a while more & lay down with contentment on his face. And before he fell asleep he thanked God again for his life & this here place. The veteran is a hero who can teach us a thing or two. And each of us is a hero. Me. And also you. The light he saw that night movin' west to east might give us a second chance. We can make things better and not be so lame. If we follow the principles of Brotherhood, and the Heroes who carried the '96 Atlanta Olympic Flame! 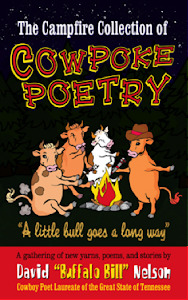 * I wrote this poem and it can be found in my book, The Campfire Collection of Cowpoke Poetry. I had the honor to carry the Olympic Torch on its way to the Atlanta Games in 1996. Even though I wrote for the 4th of July, it also applies to this Memorial Holiday. My book can be found on my web site or through Amazon. Some of my friends and classmates served in the military. Many fought in the Vietnam War. You will know who you are. I want to thank you for your service to America and for your friendship. * Chris C. * Tom P. *Whitey P. *Eddie W. *Bryan M. *Gene H. *Eddie W. *Jim F.
*Carson C. *Columbus H. *Leonard M. *Rex A. *Dennis C. Rick K. *Ron K.
*Leo H. *Frank D. *Ted S. *Ken M. *Jack S. *George S. *Mike K. *Jack P. *Bob D.
Very nice thank you David , though if I had to serve my time in the Army all over again I'd do the same way. I'd only hope We'd all get treated a little different when we returned home. Trixie's Job at the Newspaper!